Coming Soon! New edition available in January 2017, order today! 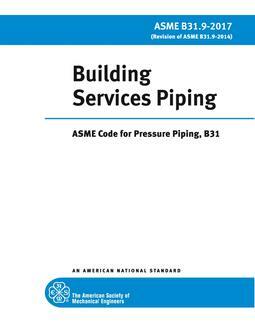 The ASME B31 Code for Pressure Piping consists of a number of individually published Sections, each an American National Standard, under the direction of ASME Committee B31, Code for Pressure Piping. 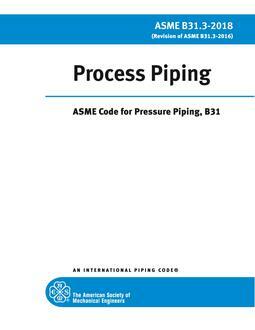 This is the B31.3 Process Piping Code Section. Hereafter, in this Introduction and in the text of this Code Section B31.3, where the word Code is used without specific identification, it means this Code Section. It is the owner's responsibility to select the Code Section that most nearly applies to a proposed piping installation. Factors to be considered by the owner include limitations of the Code Section; jurisdictional requirements; and the applicability of other codes and standards. All applicable requirements of the selected Code Section shall be met. For some installations, more than one Code Section may apply to different parts of the installation. The owner is also responsible for imposing requirements supplementary to those of the Code if necessary to assure safe piping for the proposed installation. 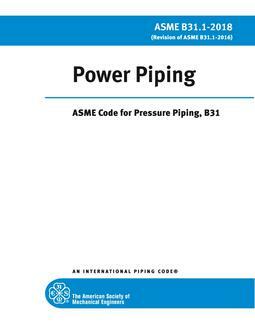 The Code sets forth engineering requirements deemed necessary for safe design and construction of pressure piping. While safety is the basic consideration, this factor alone will not necessarily govern the final specifications for any piping installation. The Code is not a design handbook. The requirements of this Code generally employ a simplified approach. Many decisions that must be made to produce a sound piping installation are not described in detail by this Code. The Code does not eliminate the need for sound engineering judgments by the owner and the designer. ASME Committee B31 is organized and operates under procedures of The American Society of Mechanical Engineers that have been accredited by the American National Standards Institute. The Committee is a continuing one, and keeps all Code Sections current with new developments in materials, construction, and industrial practice. New editions are published at intervals of two years. Code users will note that paragraphs in the Code are not necessarily numbered consecutively. Such discontinuities result from following a common outline, insofar as practical, for all Code Sections. In this way, corresponding material is correspondingly numbered in most Code Sections, thus facilitating reference by those who have occasion to use more than one Section. It is intended that this edition of Code Section B31.3 not be retroactive. Unless agreement is specifically made between contracting parties to use another issue, or the regulatory body having jurisdiction imposes the use of another issue, the latest edition issued at least 6 months prior to the original contract date for the first phase of activity covering a piping installation shall be the governing document for all design, materials, fabrication, erection, examination, and testing for the piping until the completion of the work and initial operation. Users of this Code are cautioned against making use of Code revisions without assurance that they are acceptable to the proper authorities in the jurisdiction where the piping is to be installed. The B31 Committee has established an orderly procedure to consider requests for interpretation and revision of Code requirements. To receive consideration, such request must be in writing and must give full particulars in accordance with Appendix Z. The approved reply to an inquiry will be sent directly to the inquirer. In addition, the question and reply will be published as part of an Interpretation supplement. A Case is the prescribed form of reply when study indicates that the Code wording needs clarification, or when the reply modifies existing requirements of the Code or grants permission to use new materials or alternative constructions. The Case will be published as part of a Case supplement. 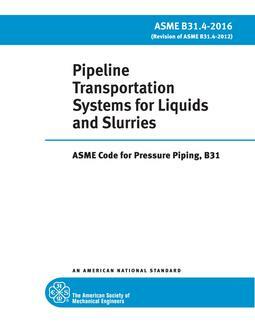 Code Cases remain available for use until annulled by the ASME B31 Standards Committee. A request for revision of the Code will be placed on the Committee's agenda. Further information or active participation on the part of the proponent may be requested during consideration of a proposed revision.